General Motors has issued a recall of over 4,300 units of the 2013 Chevrolet Malibu Eco over a concern that portions of the airbag might open under hard cornering or in some worst-case scenarios, the airbag and safety belt pretensioners may not function in the event of an accident. General Motors found during internal testing that when performing aggressive turning maneuvers in the 2013 Chevrolet Malibu Eco, in very extreme conditions there is a chance that the side impact roof rail airbags could deploy for no real reason. Having an airbag open suddenly while driving presents a risk of injury to the unsuspecting driver as well as posing a risk to other drivers and pedestrians who may be around the Malibu Eco when the airbag opens unexpectedly so this issue poses a clear safety hazard. Imagine trying to keep your eyes on the road when a huge side curtain airbag slams into the side of your head. 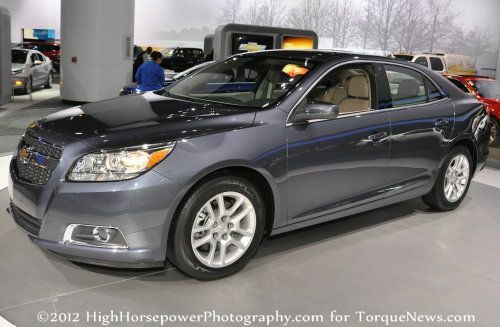 In total 4,304 examples of the 2013 Chevrolet Malibu Eco sedan are affected. Modern airbag systems like the one in the recalled 2013 Chevrolet Malibu Eco use sensors all over the vehicle to detect situations in which the airbags should deploy. These systems are tuned and timed to the tiniest fraction of a second in order to provide the highest level of protection in the event of an accident. Roof rail airbags are designed to protect the driver and passengers in the event of a violent side impact/rollover accident and among the sensors responsible are some that monitor the side to side movement of the vehicle. Based on the explanation giving by GM, it sounds like these sensors are set a tad bit too sensitive so when the car is thrown hard into a turn, the sensors are detecting that a rollover is on the way so the roof rail airbags deploy. Luckily, this recall pertains to the Malibu Eco and not a Camaro or Corvette so there probably arent many Malibu Eco owners who are hitting the turns at Laguna Seca or even their local autocross event. However, in the situation that a new Malibu Eco driver should swerve to avoid a critter on the road or some moron talking on their cell phone and not paying attention to the vehicles around them – there is a chance that the side airbags could open. The recall statement for the 2013 Malibu Eco went on to explain that in “rarer conditions”, there is a chance that the airbag and safety belt pretensioners could fail to deploy. The company doesn’t go into any detail but from that description and the programming issue related to the roof rail airbags, it sounds like there could be a programming issue that isn’t allowing the computer to trigger the airbags and pretensioners in some accident scenarios. Combined with the issue with the roof rail airbags opening, GM made the smart move and is recalling these models to prevent any further problems. GM points out that there have been no reported accidents or injuries stemming from the 2013 Chevrolet Malibu Eco airbag recall issue. General Motors will begin notifying owners of the 4,304 affected 2013 Chevy Malibu Eco sedans, asking them to return to their local Chevrolet dealership where a technician will reprogram the module that controls the airbag system. This work will be done free of charge to the customer and provided that the dealership isn’t very busy – this airbag system programming should be a pretty quick-and-easy procedure. well lets see if this recall makes the front page for 5 days. i'd say this is more serious than a backup light not coming on as was steering wheels falling off and no brake pads and rearends locking up and wheels falling off and on and on.